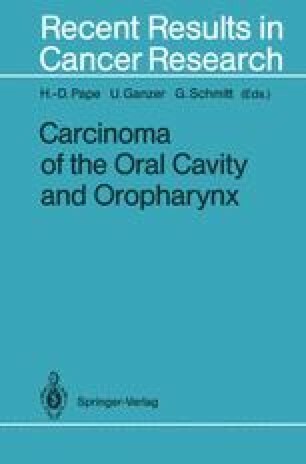 The survival time of patients with squamous cell carcinoma of the oral cavity is similar to what it was 30 years ago. Despite more radical surgery, new chemotherapeutic agents, and improvements in radiotherapy, no significant changes have taken place. The 5-year survival rates vary between 37%, as stated by Byers (1985), and 51%, as stated by Ackermann et al. (1985). A survival rate of 41%–42% would appear to be more realistic, as shown by Platz and Hudec (1986) in two German-Austrian-Swiss Association for Head and Neck Tumors (DOSAK) studies between 1952 and 1985 with a total of 2507 patients.